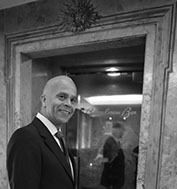 Chris Gillespie epitomizes grace, style and sophistication in keeping with the tradition of the Carlyle Hotel. He has performed in Austria, France, Germany, Australia, Colombia and the Philippines. As a composer and performer, he has entertained Sir Paul McCartney, Bette Midler, Mary Wilson, Billy Joel, Steve Tyrell, Paul Shaffer, Luis Miguel, and heads of state: Juan Manuel Santos, President of Colombia, Petar Stoyanov, President of Bulgaria, and Bill Clinton. Before Mr. Gillespie earned the coveted position of playing 5 nights a week in the prestigious Bemelmans Bar in 2001—either with his trio (Keith Loftis, saxophone, and Dmitri Kolesnik, bass) or on his own—he performed in other respected venues such as Windows on the World and The Rainbow Room. Standing out from the crowd, Chris draws from his influences of Bach and Gershwin, combining jazz and classical music as though they were intended to be played together, with audiences erupting in cheers when they hear the transition from one to the other, especially in his take on Paul Desmond's "Take 5”. Chris’s discography consists of “You’ve Arranged the Stars For Me”, a commissioned recording of originals, a compilation from the Great American Song Book titled "L-O-V-E”, and an album produced by Joyce Johnson, “Live At The Carlyle”. His latest recording, “Portraits Of Porter”, is an all-Cole Porter tribute with Bucky Pizzarelli and Martin Pizzarelli on which one can truly experience the broad palette of Gillespie's interpretations. He is also featured on Frank Tate’s album, which is a collection of songs performed by various artists who personally knew the legendary Bobby Short. Mr. Gillespie’s next release will be “The Early Show” (title of the album to be determined), an album replicating the Bemelmans Bar experience when he entertains on his own. Mr. Gillespie has performed at Avery Fisher Hall, Jazz at Lincoln Center, Merkin Concert Hall, The Lehman Center for the Performing Arts with Marvin Hamlisch and the Cafe Carlyle. His appearances on FOX5, NBC, FoxBusiness News, NPR (National Public Radio) in an interview with Faith Middleton brought exposure of his work to a larger audience. Chris Gillespie entertains at Bemelmans Bar at the Carlyle Hotel in New York City from Tuesday to Saturday, 5:30 PM - 8:30 PM, or from 9:30 PM - 12:30 AM For further information, please contact The Carlyle Hotel at (212) 744-1600.